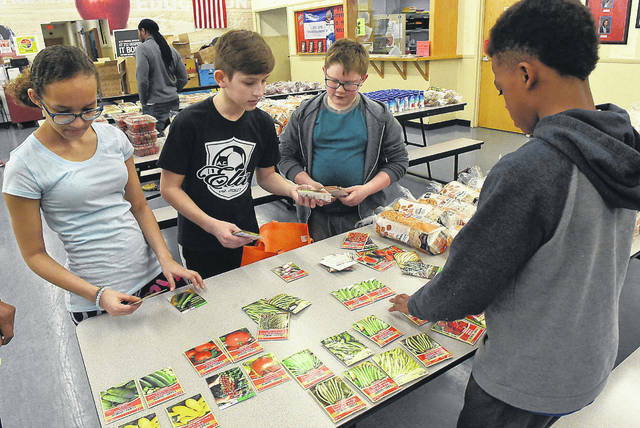 Heir Force Community School fifth-graders Adriana Donovan, 11, left, Isaac Grundisch, 11, Alan Miehls, 11, and Elisha Reddick, 11, sort out seeds during Global Youth Service Day at the school on Friday. After some research, Miehls and Grundisch came up with the idea of hydro veggie gardening for families, which means growing vegetables in their own at homes in water that could be perpetual. All it would take is seeds, water, nutrients, and maybe a grow light. The school has partnered with the West Ohio Food bank who has offered to provide the seeds needed to begin the project. This initiative is called Ҏo Child Hungry Hydro-Veggie Gardens. The school plans to use part of the $400 grant from Sodexo Foundation to purchase the aquarium, gold fish, fish food and grow light. Students are trying to prove their theory that a small investment in this could sustain a family with nutritious salads indefinitely. LIMA — Fifth graders at Heir Force Community School will be getting a new class pet soon — a carrot-making fish. Their solution was a hydroponics set-up that used the droppings of fish to provide nutrients for a number of plants situated on the top of the fish tank. The final result is expected be a cheap, easy and urban way to provide healthy food. The fish provide nutrients to the plants, and the plants provide the food. And to get the fifth graders Alan Miehls and Isaac Grundisch started, the Sodexo Stop Hunger Foundation provided a $400 youth grant. “It’s just way more fun to experiment with the water,” Grundisch said. In line with the initiative, Heir Community School also held a food giveaway Friday afternoon during Global Youth Service Day that acted as a kick-off to the indoor-gardening project. As other school students went through life Friday, their fifth grade peers were stacking food and making sure enough food was available for those going through line. While the fish food tank has yet to be assembled, the class will be moving forward with the project sometime next week. By the end of their experiment, Miehls said he would like to be able to grow enough food — primarily greens, tomatoes and carrots — to be able to provide a meal for all 100 students of the Heir Force Community School. If the group can prove of its effectiveness, the two can help other families with a similar set-up. “If things get really bad, they can always have a salad,” Shurelds said.